Iván Acosta (b. 1943) has dedicated his life to preserving and fostering Cuban and Latino culture as playwright, filmmaker and publicist. Based in New York City since leaving Cuba in 1961, Acosta was founding member, and long-time director, of the Centro Cultural Cubano. He studied film at NYU, and theater with Alejandro Jodorowky, The Living Theater, and New York Theater of the Americas. 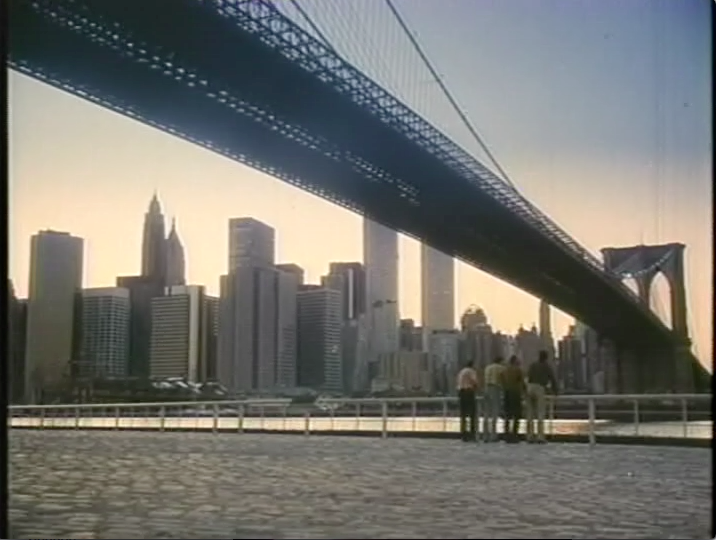 His play El Súper (1977) is a canonical text of Cuban-American and Latino drama, and is the basis for the successful film of the same name directed by Leon Ichaso and Orlando Jiménez Leal in 1979. In 1989 he created Latin Jazz, USA, which promotes Cuban and Latin Jazz concerts all over the United States. Acosta has directed several documentaries on Cuban music and continues to write and direct theater. His play Cuba, Punto X (2012) won several Ace Latin Awards receiving the Hola Award for Excellence in Theater for best director in 2013. He is currently securing funding for Guantánamo, an ambitious film project thirty years in the making, that will be shot in both the US and Cuba. In the following interview, Acosta talks about Amigos (1985), his first full-length film project as director and screenwriter. The film traces the tragic comedic experiences of Marielito Ramón as he arrives in Miami, reunites with family and friends, and attempts to rebuild his life in a foreign, and often inhospitable, environment. CC: In many ways, Amigos could be the El Súper of the Mariel generation, in that it touches on many different aspects (both positive and negative) of the Cuban community, this time in Miami. How would you describe the film? What inspired you to write the screenplay and make your directorial film debut on this topic? How long did it take to film the movie and how did you get it financed? IA: Let’s see. I happened to be in Miami when the Mariel exodus started. Early May 1980. I went to direct my play, No son todos los que están. I was having un cafecito cubano at 2AM at Versailles cafeteria, when a car parked in front of me, and these three Cubans toasted by the sun in worn shorts and T-shirts exited the car and came to have some Cuban coffee and pastelitos de guayaba. With them was Mr. Bernardo Benes, a gentleman who played a very important role orchestrating the Mariel boatlift, between President Jimmy Carter and Cuban dictator Fidel Castro. That’s where the Mariel story began for me. The next day, all radio stations and TV networks started transmitting the BIG NEWS. I was supposed to return to New York, but I decided to stay a few more days in Miami. Ramón and other Marielitos arrive in Miami. Everything sounded unreal. I knew about the 10,000 Cubans who jumped the fences of the Peruvian embassy in Havana, asking for political asylum. The whole world was watching. The Cuban dictator, perhaps hoping to save face, announced on national Cuban TV that any Cuban who wanted to leave the island, would be allowed to do so through the port of Mariel. In less than five months, more than 124,000 Cubans—men, women, children, whites, blacks, Chinese, professionals, workers, students, ex-political prisoners, homosexuals, and artists—arrived at Key West marinas. Along with 7,000 or 8,000 of the worst criminals, hand picked from Cuban jails by government agents, and thrown into the boats that went from Miami to rescue their Cuban families. I visited two of the refugee camps and had the chance to talk to several of the recent arrivals. At that time I was starting to write Guantánamo, another film screenplay that we wanted to shoot in the Dominican Republic. Speaking with my friend Marcelino Miyares, who was the C.E.O. of WBBS Channel 60 in Chicago, I told him it would be great to film a documentary about the Mariel experience; Marcelino asked me, why not a movie instead? I set Guantánamo aside and started writing Amigos. We created a company, Manicato Films, and by spring 1984, we already had some committed investors. Pre-production started in May and filming in July. It took us 8 weeks to film Amigos. We filmed 80% of the film in Miami; the rest was shot in South Carolina, Washington DC, Union City, New Jersey, and New York City. The Cuban community in Miami had a very negative attitude towards the new refugees. So, to me, it was very important to tell the human story of the Marielitos. In Amigos, we aimed to do just that, in El Súper’s style. In El Súper, I had Roberto Amador Gonzalez expressing the Cuban exile experience of those days. In Amigos, I have Ramón Goizueta Fernández, telling the stories of many Cuban refugees who decided to leave everything behind, to escape through the Mariel boatlift. I wrote the script as a bittersweet comedy drama. That’s the style I use in all my theatrical plays: El Súper, Cuba: Punto X, Rosa and the Executioner of the Fiend, and in my latest play, La ventana de los Chévere. Of course, the Cuban ultra conservatives or extreme right of Miami who didn’t like certain things I portrayed in El Súper, also didn’t like some of the things said and denounced in Amigos. In both films, music plays a very important role. CC: In one of the first scenes, Ramón describes the horrors of the Mariel immigration to Cecilia, actos de repudio, and the uncertainty of the Peruvian Embassy. Also, on several occasions throughout the film Ramón, while in prison for eighteen years, attempts to relay his traumatic experience to various other characters who tell him to just forget about it. Why did you decide to characterize Ramón in this way? Is he based on a specific person or does he incarnate several stories that you encountered or heard about at the time? Could this film be a defense of Marielitos and a chance for them to tell their own story? Ramón remembers the actos de repudio. Film still. Yes, Ramón represents various characters. I tried to communicate different Marielitos’ horror stories, through the characterization of Ramón. I happen to know some ex-political prisoners who spent several years in Cuban jails and concentration camps, and their stories are very sad and touching; it is amazing all the human right violations they had to suffer while in prison. I do think the film tries to fairly represent new Cuban refugees. In the Miami Herald, a critic mentions that Amigos “may help atone for Scarface.” Starring Al Pacino and Steven Bauer, the movie was becoming very popular. Scarface had a budget of over 30 million dollars. Amigos was produced with less than 340,OOO dollars. But, at least, that’s what we were trying to portray, the positive face of 95% of Marielitos, “the other face of Scarface.” As far as I know, Amigos is one of a few feature films based on the Mariel exodus. There are 4 or 5 documentaries, but nobody wanted to touch the theme, in the humorous way we handled it. Thanks to executive producer, Marcelino Miyares, we were able to gather a group of investors who believed and supported the project. CC: The film seems to celebrate an exaggerated Cuban masculinity, as the Amigos constantly talk of, and stare at, women. 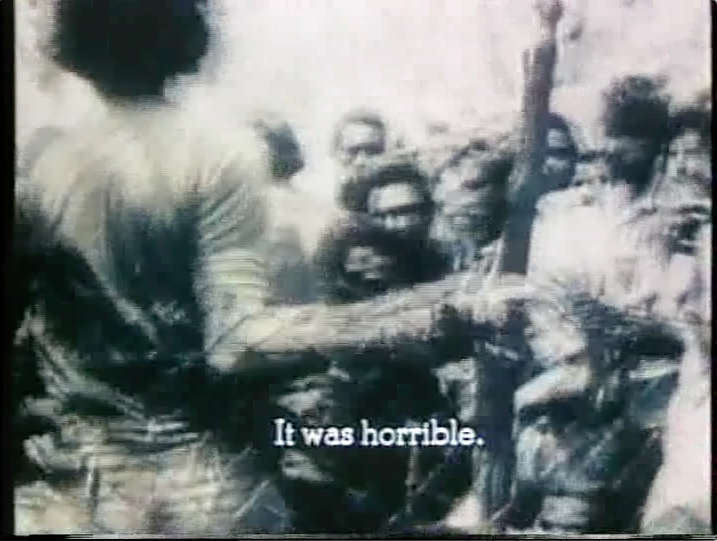 However, some of the more humorous parts of the film are when this machismo and its participants are ridiculed. I think of the scene when it is Mirta who seduces a nervous Ramón, and many others. The same happens with the scenes from the weekend training camp where Gavilán is preparing some of his compatriotas for invading Cuba (a la Bay of Pigs). However, their pitiful display of combat instinct makes him say, “Con guerrilleros como ustedes la patria está muy jodida.” Can you comment on the use of humor (even choteo) in this film to comment, and at times criticize, certain aspects of the Cuban exile culture in the US? 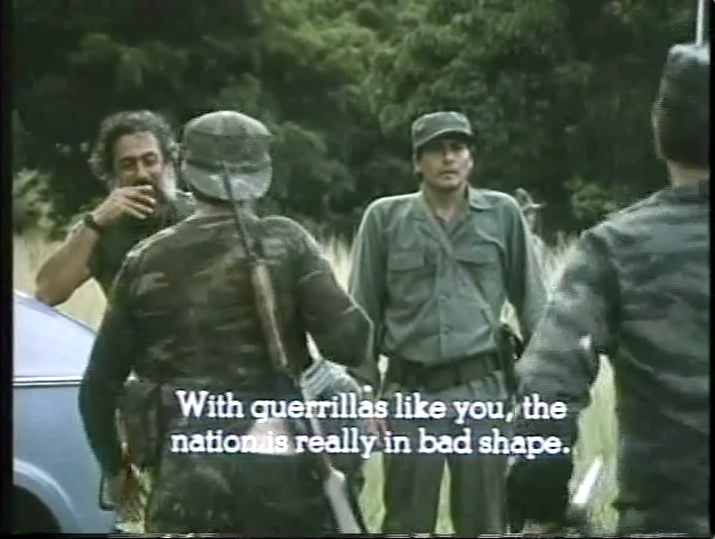 ‘Con guerrilleros como ustedes la patria está muy jodida.’ Film still. IA: Yes, as I said before Amigos is a bittersweet comedy drama, full of choteo, Cuban humor. We all know Cuban machismo; I have seen it and experienced it all my life. You see, the revolution was the greatest promoter of machismo. All those bearded, sweaty, cigar smokers and trigger-happy militiamen impregnated the macho image—an image the maximum leader always projected and demanded among revolutionary militants. Hundreds of homosexuals were sent to prisons and to hard-labor concentrations camps, las UMAP, just for not being macho enough for revolutionary standards. Cubans, pro and anti Castro, somehow tried to imitate the Máximo Líder. I have always disliked the extreme machismo, not only among Cubans, but among all men: Americans, blacks and whites, Cubans, Mexicans, Central and South Americans. We do know machismo exists, and in many societies it is celebrated and even rewarded. That was what happened in Cuba after 1959. The men wanted to be more manly than ever before, and that influence came with the exiles. I tried to ridicule the absurd machista behavior throughout different scenes in the movie. Pablo and Ramón ogle women at Magaly’s aerobics studio. Film still. IA: We had several groups of so-called anti-Castro counter revolutionaries who would go to trainings on Saturday mornings, and after the training they would go to have the biggest churrasco on the menu. There have been small amounts of serious Cubans who thought they could go and start another Sierra Maestra uprising against Castro’s dictatorship. They were very brave, ignorant, and patriotic men. Some disembarked in Cuba and were killed in less than 48 hours. The Cuban army became the third largest and best-trained armed force in the American continent. How could a group of 20 cojonudos Cuban patriot combatants dare to think they could start an armed uprising against the master organizer of subversive armed uprisings in Latin America? Queriendo bailar en la casa del trompo. If you remember, in Amigos Ramón and Olmedo, the funeral men, get lost and frightened at the training camp and end up almost eaten by crocodiles. In real life, after the training, they would probably go to have the big churrasco on Calle Ocho, and start telling the story from a different angle: “Oh man, if you could only see the big 15-foot crocodile that came to attack us… Olmedo and I emptied our machine guns on it, and forget it—in a while, crocodile.” That’s very typical of Cubans: exaggeration. There you can see the different tonalities of machismo. To me, machistas, racists, and homophobics go hand in hand. Unfortunately, that mentality exists among some Cubans, in exile and in the archipelago. 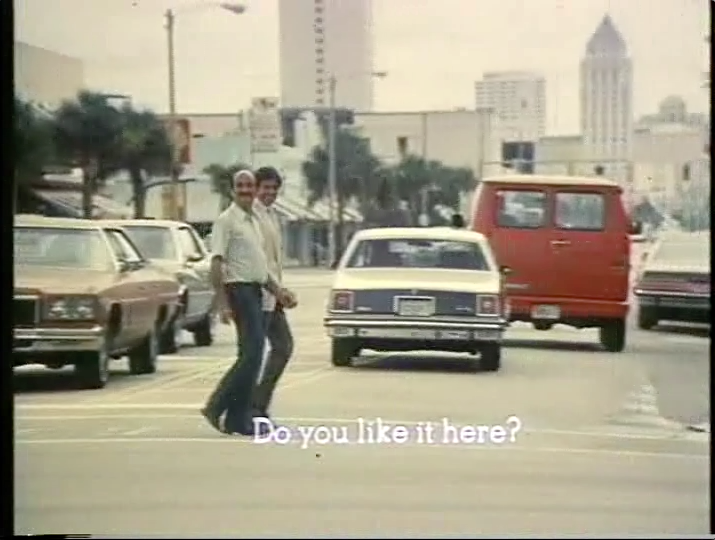 CC: It seems that Amigos both pays homage to the best of Cuban culture and the city of Miami (you film in several recognizable locations throughout the city) and, at the same time, exposes the many contradictions in the Cuban exile community. In fact, it is a delicate balance that you manage to attain in the film between these two perspectives. What did you hope to accomplish by showing all these sides of the city and Cuban community? IA: I love Miami. I have never lived in Miami, although I visit it at least once a year. I have produced several Latin Jazz USA concerts, plays, and a large number of TV commercials in the city. In Amigos I tried to do that, pay homage to Cuban Miami without being a panfletario or a caricaturist. Pablo takes Ramón on a walk in Miami. Film still. You see, I’ve lived all my 50 plus years in exile in New York City. They always say Cubans in New York think different than Cubans in Miami, even than Cubans across the Hudson River in New Jersey. It is true, Cuban New Yorkers think and have a different perspective of the Cuban situation in general. We always hear about “Cuban Success,” which is real for some, but we never hear about a majority of hard-working Cuban exiles: in factories, restaurants, mechanical shops, construction, farms, etc. Those represent the real Cuban exiles, the working men and women who, in several cases, risked their lives to escape from Cuba to live and work in freedom. But some people consider successful those who accumulated several millions of dollars and have a luxurious yacht, a big mansion with 5 or 6 expensive automobiles. In Amigos, I tried to show that balance without criticism, the gap between the Cubans who have a lot and the unsung heroes who built the Cuban Miami and don’t have as much. I think the last scene of the movie is very symbolic, when Ramon’s friends give him the key for the humble coffee shop next to the Domino park, on Calle Ocho, while the popular celebration of carnival is taking place. I’m sure some sociologists, historians, and anthropologists would find more hidden messages than the general audience. However, at the end, all Cubans are Amigos. 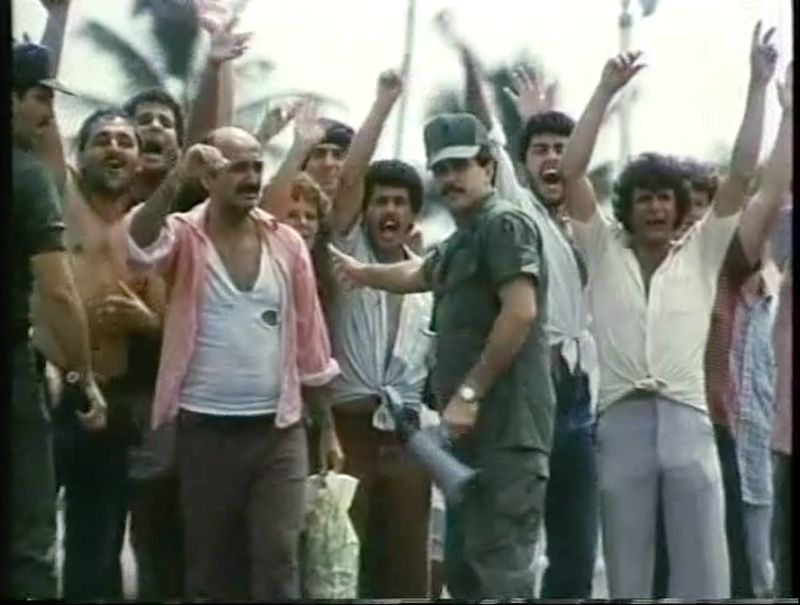 Acosta: ‘at the end, all Cubans are Amigos.’ Film still. CC: So, do you think the image of the wealthy, assimilated, exceptional Cuban that is often touted only speaks to a minority of the Cuban community in exile and that the majority of Cubans have more in common with other Latinos, in terms of their struggles to attain success and stability? IA: Well, according to several studies and reports, Cubans exiles who came during the 60s and 70s became very successful and some, very wealthy. Most of those Cubans had a profession, a skill, business experience, know-how. After a while they started dancing in the gold mine ballroom of opportunities. But the immense majority of Cuban exiles during those first two decades worked and struggled, as hard as any other Latino immigrant. In a way, those are the underdogs, represented by the protagonists in El Súper and Amigos. CC: It has been thirty years since Amigos was made and thirty-five since the Mariel boatlift. What continues to make the film worth watching after so many years? How does Amigos fit into your trajectory as a filmmaker and playwright? 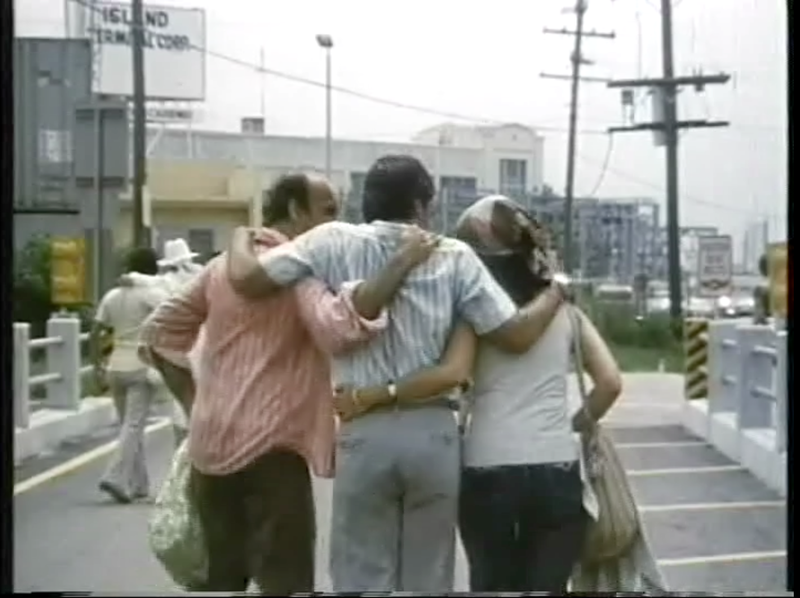 IA: As I mentioned, Amigos is one of the few fiction feature films about and around the Mariel boatlift historical event. Audiences identify with the protagonist Ramón, laughing and feeling sad about some of his pathetic situations. For 30 years, on the Mariel anniversary, the film is shown at different universities or cultural centers, even at some cinemas, to celebrate the event. The film has been shown in several countries around the world, including Spain, Israel, Italy, Egypt, Puerto Rico, Colombia, Venezuela, Argentina, Canada, Mexico, and Brazil. As a filmmaker, Amigos represents an experience I will never underestimate. I am very happy we were able to create and produce it, and contribute to the Cuban exile’s history. Now that Cuba is turning pages, I know Amigos will be shown in Cuba, and hopefully it will serve as a granito de arena that shows our Cuban brothers and sisters on the island another chapter of our last 56 years. Carolina Caballero received her Ph.D. in Romance Languages from the University of North Carolina at Chapel Hill where she specialized in contemporary Latin American literature, particularly that of the Caribbean, with a supporting program in Brazilian literature. In her dissertation, Dr. Caballero explored the performance of exile in drama of the Cuban diaspora. Her other research interests include types of violence in Cuban exile drama. Currently, Caballero lectures in the Department of Spanish and Portuguese, at Tulane University. Te felicito! Cuando vamos a Cuba? Abrazos…. Wonderful interview, by the way! Fantastic interview. Ivan Acosta has truly brought to light the Cuban story, from his El Super and Amigos. Showing the good, not hiding the struggle; Always leaving his audience with hope for the future. Looking forward to Guantanamo.